I love beef stroganoff. There’s nothing better than luscious egg noodles coated with a rich tangy beefy sauce to bring comfort to my belly. Moms and grandmas make it all over the country, but it was certainly no easy feat trying to locate the best stroganoff in Orange County. In fact, it wasn’t easy finding it on many restaurant menus, let alone the best ones. 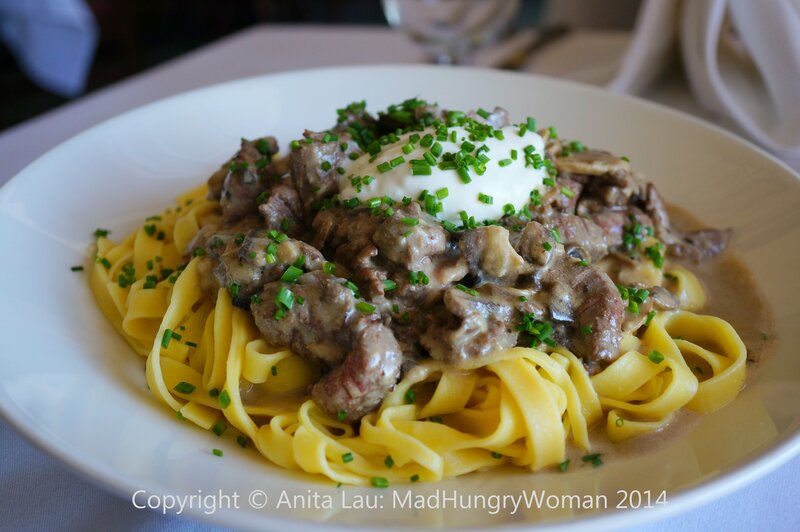 After months of searching, I’m afraid to say, I’ve eaten some pretty awful beef stroganoffs and have only come up with a few I feel I can put into this post. For me, it has everything to do with the sauce which has to possess some form of tartness (traditionally from sour cream) on my palate. Quinn’s Old Towne Grill — this restaurant has kept the beef stroganoff on its menu for probably as long as the restaurant’s been in business. The one here is authentic, with mushrooms and sour cream, but was a tad under-seasoned for me. However, I commend its efforts in keeping with tradition. 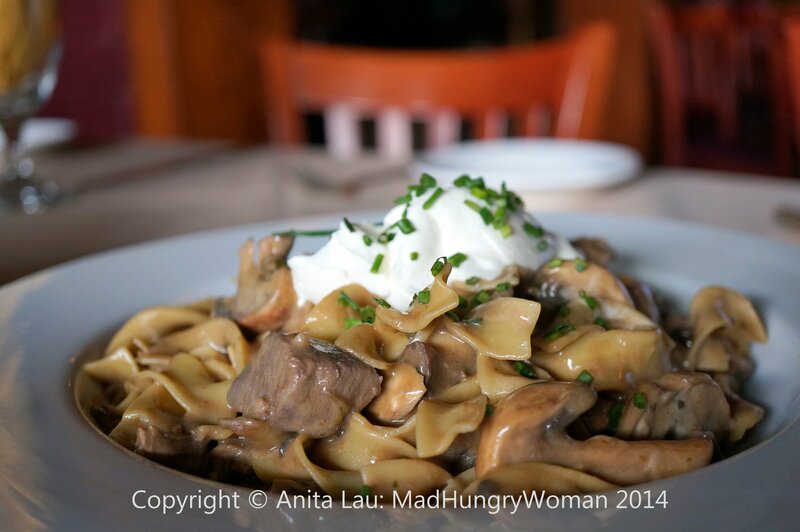 Nieuport 17 — in terms of authenticity, this beef stroganoff wins hands down. This institution sticks with the traditional ingredients such as sour cream, mushrooms, egg noodles, and seasoned to perfection. Isn’t it crazy that the two most traditional beef stroganoffs are in Tustin and only several few blocks from each other? Old Vine Cafe — Chef Mark MacDonald’s version is very tasty, though, not traditional. Shiitake mushrooms add another meaty dimension to this delicious offering and the sprinkling of grated cheese, a lovely salty component. 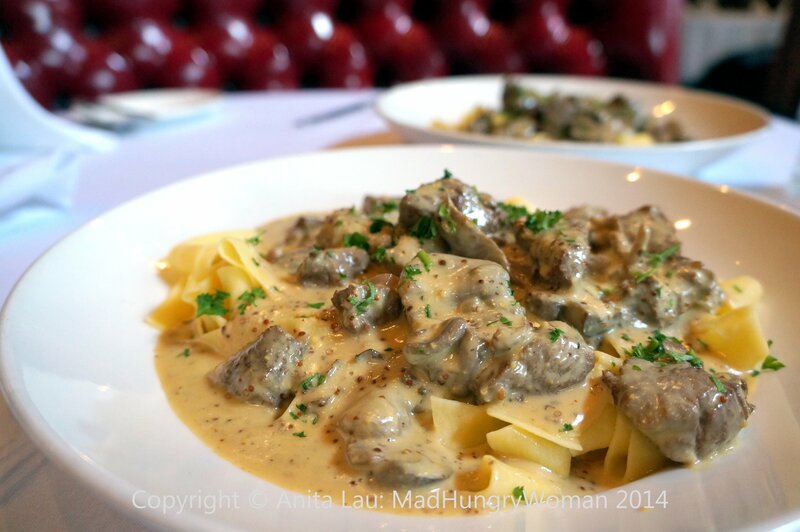 Savannah Chop House — another not so traditional version, but possessing a beautiful tartness from grain mustard, this is my favorite beef stroganoff of all. The amount of acidity is perfect on my palate and gives just the right amount of mouth puckering for me to keep eating. That’s it for now. If any of you have other suggestions, please let me know and I’ll continue my search and post another piece sometime down the road. 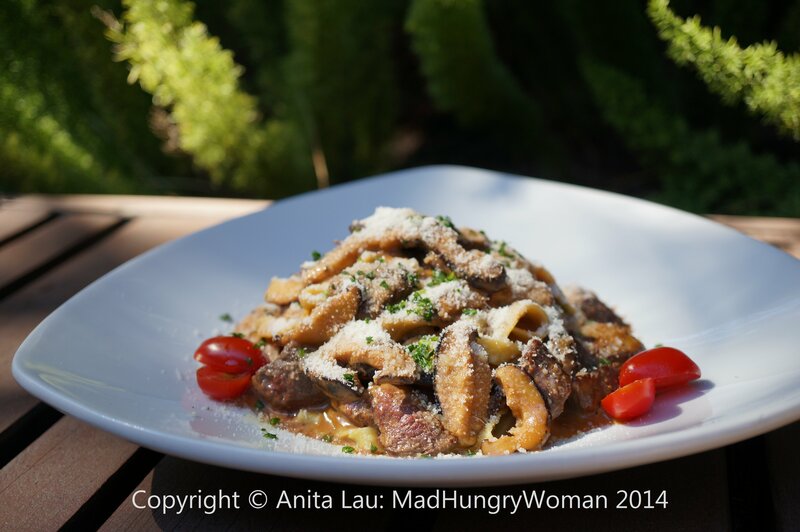 This entry was posted in comfort, Orange County and tagged beef stroganoff, comfort, food, Orange County by Mad Hungry Woman. Bookmark the permalink. My nephew had the Porterhouse Strognoff at Salt Creek Grill in Laguna Niguel last night. He said it was the best stroganoff he has ever eaten. thanks Nick — I guess the search continues…..
thanks! hmmm the GM told me it’s been around for decades. I’ve always been a fan of beef stroganoff. It’s never on any menu I’ve seen in the OC. The Savannah Chop House version appeals to me the most.